Canada belongs to the highly developed countries, and the mobile market remains at a high level here. 95% of the population - 29 million subscribers –have long enjoyed GSM format. Coverage is available across the country, and even in its northern part, where, apparently, there is much less population than in other areas. Moreover, subscribers use not only GSM-standards, but LTE, VoLte, VoICE, and so on. With respect to GSM-standards, it should be noted that in Canada the European standard for cellular communication is available everywhere. GSM 1900 is especially prevalent. Terminators have to consider it, if they want to install a software GSM gateway here. Major operators like Rogers, Telus, and Bell provide mobile communications. Rogers is represented by the brands Rogers Wireless, Fido, and Chatr. Telus works under the trademarks Telus Mobility, Koodo Mobile, and Public Mobile. Bell includes brands Bell Mobility, Virgin Mobile, and MTS Mobility. About 10 million people use the services provided by Rogers, 8.4 million Telus, 8.3 million subscribers Bell. Do you plan to invest in the GSM termination in Canada? You will be interested in GoAntiFraud NewBusiness offer for beginners. This is a business package that includes everything you need to work at an early stage. In addition to VoIP equipment, AntiFraud protection tools and convenient software, we provide professional technical support at all stages of your business! However, the packages of these operators are quite expensive for the termination. Originators deliver traffic for as low as $0.0033 per minute. And even with a minimum payment of $15.75 for the connection to the tariff plan Fido (Rogers), the operator provides a total of 30 minutes for local calls, which is very little for the termination. 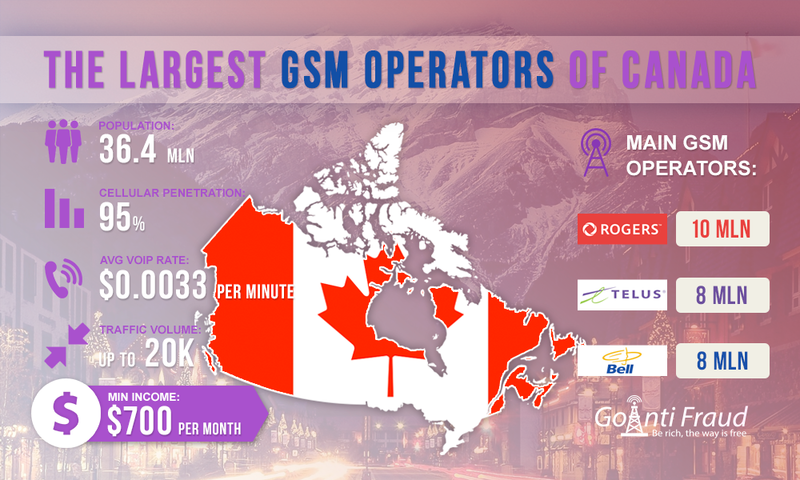 There is a way - choose the best package for GSM termination in Canada from those offered by small local mobile operators. The population of the provincial areas of Canada mainly connects to the local operators, which is 10% of all subscribers - about 3 million people. They provide good GSM coverage and excellent performance. Operators that provide their services in provinces of Canada are Vidéotron General Partnership (Vidéotron Mobile), SaskTel (SaskTel Mobility), Eastlink (Eastlink Wireless), Ice Wireless (Ice Wireless, Sugar Mobile), and Tbaytel (Tbaytel Mobility) offer a wide range of prepaid tariff plans. However, most of the prepaid packages are too expensive for the termination of voice traffic. The cheapest tariff is Day Plan offered by Tbaytel (Tbaytel Mobility). When connected to this tariff plan, one termination minute will cost $0.001. Even if you install a GoIP 32 gateway, maximum income will be $700 per month, which is not so much for the termination. This gain is much less than in other countries. Increase your revenues from GSM termination in Canada, using GoAntiFraud! We provide you with proven tools to protect the SIM-cards from the lock and will render professional assistance in setting termination logic, in accordance with the characteristics of your country.